What is the real cause of forklift accidents? Although driver error accounts for a portion of these accidents, roughly 25% of accidents include causative factors like: poor lighting, high noise levels, poor pedestrian traffic control, high speeds, poor safety aids on equipment, dangerous driving conditions, and insufficient aisle space – all of which can be resolved through corrective action before an accident occurs. How are light levels in your facility? Take a serious look at your facility and operations. What environmental factors can you change that will reduce forklift accidents? Consider lighting – general operations in warehouses typically require about 10 to 20 horizontal foot-candles. What about the deep, dark recesses in your storage aisles? If light levels are below 2 lumens per square foot, you’ve got lighting issues. Resolve those with additional lighting in the aisles and darker areas of the facility, or add lighting to the forklifts. You’ll be increasing safety plus improving productivity. Can workers hear a forklift approaching or the forklift the backup beeper? If it’s too loud to hear these things, then it’s also too loud for workers in general. You’re not only facing the potential for forklift accidents, but you’ve got hearing loss claims bearing down in the future. Reduce noise by isolating equipment with acoustic screens or curtain walls to deaden sound. Specify maximum noise levels when ordering machinery and opt for quiet design conveyor systems. Keep pedestrians safer by creating clearly marked and barricaded traffic lanes and work zones. Educate personnel and visitors about staying within the marked pedestrian zones. Enforce training with steel guard rails that keep forklifts and pedestrians from running into each other. Then go one step more - assess hazard locations where forklifts can appear unexpectedly from around corners, doorways and ramps. Put protective devices in place at those locations that increase awareness, alert oncoming traffic, and that prohibit pedestrians from crossing the path of an oncoming forklift. Wide view mirrors placed strategically greatly enhance visibility for both forklift drivers and pedestrians at intersections where oncoming traffic is hidden from view. Motion detection alarm systems use flashing lights and audible sirens to alert both forklift drivers and pedestrians of oncoming traffic. These are both great safety additions, but they still leave the decision about proceeding up to the individual. In busy warehouses, you can’t afford the risk of those choices. At crossings and intersections, you need a physical barrier like the AisleCop safety gate system which requires the pedestrian to push a button in order to open the crossing gate. Through a motion detection monitor, the system determines if the crossing is clear of traffic and will open the gate if conditions are safe. If there is oncoming traffic of any kind, the gate will remain closed until the traffic has moved safely out of range. Only then will the gate open, lower the forklift barriers, and allow pedestrians to safely cross. Just how fast are your drivers travelling? Are they under pressure to perform and feel that speeding is the only solution? Post-accident audits show this can be the case. Generally, forklifts involved in accidents are averaging 8 miles per hour, and while OSHA has not set speed limits, keep in mind our momentum equation – mass (large forklift) x velocity (weight x speed x 1.5). At even 5 miles an hour, that fully loaded forklift is now equivalent to a full size car travelling at 20 mph. That’s a lot of impact force and capacity for injury and damage. Within the rack aisles, speeds should be even slower to compensate for the increased likelihood of encountering workers in the aisles. Speeds should be no faster than 3 miles per hour, making it easier to avoid collisions and keeping stopping distances shorter. These speeds should be strictly enforced. Lost production costs won’t be anywhere near what you’ll be paying in injury claims if you don’t enforce speeds. Can operators see around the forklift well? Visibility is only the tip of the iceberg when it comes to forklifts. Wide angle rear view mirrors are a must. Have frequent inspections to ensure horns and backup beepers are working. What are your safety protocols in regard to using the horn? Do your drivers use their horns? Is everyone trained on the meaning of different beep patterns? What about equipment and driving surface conditions? Are forklifts inspected routinely? Are the correct replacement parts installed? Keep in mind that changing the battery weight can also change the forklift’s ballast weight, which alters the lift and load capacity. It also affects steering control. Stick with factory defined parts. Remember that OSHA prohibits altering ballast weights. 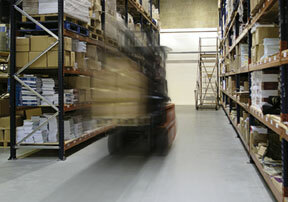 How about the surfaces your forklifts are travelling over? Tires designed for smooth concrete floors are going to respond differently on asphalt or loose soil. Unexpected dips in the travel surface can upset the load balance, creating the potential for injury from falling loads. Make sure that not only your forklifts are in top condition, but also the surfaces they will be travelling on. Yup – you need to keep them clear of clutter, stacks of broken pallets, temporary work zones and other obstacles to safe driving. Good housekeeping definitely goes a long way toward increased safety, but how about aisle spacing? If aisles are too narrow, forklifts are not going to be able to maneuver safely within the aisle. Drivers who are more concerned with not hitting racks than with watching for other workers make that momentum equation a reality. They’re going to end up learning a lot about stopping distances and impact force, too. With forklifts, it all comes down to mass x velocity. Follow correct procedures and momentum increases in all the right ways: improved safety x better worker attitude x increased productivity = success.